Yup. Just redesigning the logo–whether simply updating fonts and colors or a complete logo redesign–is not brand redesign. Just slapping that logo redesign on everything isn’t a rebrand. Why? It’s incomplete. And it won’t have the impact you want. Your brand lives in the experiences people have with your company, your people, your products. Are they delighted–enough to want to share their excitement? Or are they frustrated with a hard to read website, grumpy staff or products that don’t work as promised? A brand persona lends power to how you’re recognized, perceived and understood. Casual or traditional, bright colors or subdued, friendly or formal. Think of your brand’s persona as an individual, someone with a strong personality you can relate to and befriend, or perhaps someone that’s not a good match. The brand’s design (clothing and hair style) can shift to create a new impression, while the core (logo/organization) remains the same. Yet more often than not, the logo is a tiny part of the top navigation on a website, an element on business cards and a small signature in ads. Elements which surround that logo as a visual system–colors, fonts, design style and imagery–are what support and build the brand’s recognition. The visual system and key messages are often remembered before the logo. We’ve worked with many companies to help them rebrand and reframe their message, reinvent their website, or restage their advertising … all without a logo redesign. Yet their comprehensive brand redesign drove recognition and growth. SELCO Community Credit Union didn’t want to change their logo and signs, but they wanted to be the “Nordstrom of Credit Unions.” We gave them a complete brand refresh around the existing logo. Cascade Employers Association decided to keep their name (a rename was considered) and their logo. We created messaging hierarchy to define how they’re unique. Refreshed colors and design style restaged the brand. Salem Convention Center didn’t change the logo. Instead we reinvented their advertising program and website to add visual impact and clearly distinguish top benefits. A logo redesign wasn’t needed. 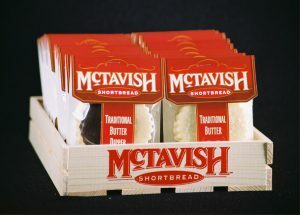 Packaging redesign for McTavish Shortbread kept the logo but completely reinvented the look, structure and design of the cookie packaging. As a result, they sold a LOT more of their delicious cookies! Old packaging placed the emphasis on the logo, not the cookies and their flavors. A great logo design draws the eye and connects one communication with another, website to advertising, packaging to sales materials. The importance of a logo as a visual icon can’t be diminished. Symbols and icons are integral to the history of communication. After all, when the general public couldn’t read, symbols were used to communicate who, what, where. Yet it’s the overall brand system, not a logo redesign, that creates recognition. The packaging color (Tiffany blue) or the shape (Coca-Cola’s classic bottle) or a bold visual style (Nike’s print and TV ads) or the combination (Apple packaging, stores, ads) … Each uses specific visual elements to create both a first impression and ongoing recognition. New packaging built a different context for the brand. It showed off the cookies, their handmade quality, and flavor choices. 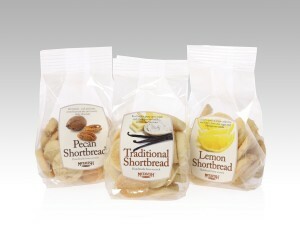 It also reduced packaging costs significantly. Once you’re recognized, what’s next? How do you capture a few more precious seconds of attention to draw someone into who you are and what you offer? To compel them to pick up that package of cookies, or to drive your prospect to click deeper on your website? Look at the websites you find most appealing. Analyze what draws you in and keeps you looking. Good design is essential, yes. But that’s not the logo. It’s the overall look and feel. It’s the chosen pictures; the way the page is laid out; the colors and how they work together. But most of all, does the site give you the information you’re looking for? Once you get there, is it clear where you’ve landed? Does the content answer your questions? Do the photos, stories and messages pull you into the content so you keep reading and clicking? At the center of connecting with your best audiences is messaging–the verbal brand. Design supports message, it doesn’t replace it. A logo redesign doesn’t affect context until you build that part of the brand. No matter how or where someone hears about you–a radio ad, from a friend, seeing a billboard or print ad– if they’re interested, what are they likely to do next? Look you up online. Your logo doesn’t help someone find you. Your website design doesn’t bring anyone to your site. When someone searches, they use words, phrases or your company name. The right words, from your audiences’ point of view, are vital in today’s online, internet-focused world of marketing … for both SEO (search engine optimization) and to communicate the value of what you offer to the right people. The brand is undergoing a paradigm shift. It’s no longer a mark. It’s not even a voice. It’s an intelligent entity, a personality, an algorithm capable of learning. Although we’re not quite ready to agree AI is the next level in brand redesign, we agree there has been a paradigm shift away from focusing on the mark, the logo. It’s no longer the essence of identity. The logo design is merely one brush stroke in the brand design painting. Perhaps you’re just looking for a logo redesign, and just a logo. It can be simple to create a new graphic to replace one that’s outdated or difficult to use in the digital world. There are lots of options for a basic logo redesign, including online services such as TailorBrands.com (though they say they’re doing branding, they’re offering logos); or Fiverr.com for freelance services; or apps such as Makr. They’ll be inexpensive … and you’ll get what you pay for. Yet that may be all you need. If your budget is limited, we recommend you spend it on positioning and messaging work instead of logo design. For a good to great logo, hire a professional designer with a solid portfolio of logo design work. But that’s still not a brand. When it comes to brand redesign or a rebrand, it’s a longer process and deeper question. Probe who you are, how you want to be perceived … and build a visual and verbal brand to capture recognition and response. Integrate essential messaging and build a visual vocabulary as a foundation to all communications. Brand refresh or rebrand, what’s the difference? 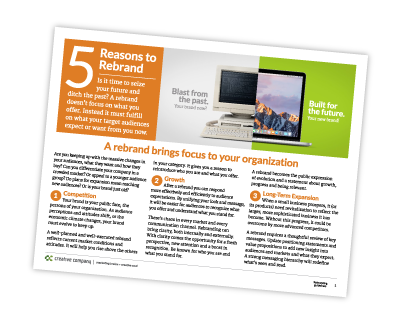 You may be interested in our rebranding worksheet, download it below. Want to talk further? Drop me an email and let’s schedule a conference call. This is really an amazing article. I got good ideas by this article. Thanks for sharing this awesome post.